Swaffham's fine Georgian buildings are a reminder that this town has long been a commercial centre - reputed to be a one time favourite of Lord Nelson. Amongst its more famous sons was Howard Carter, the Egyptologist who discovered the treasures of Tutankhamun, now celebrated in the excellent Town Museum, alongside other famous Norfolk sons who lived, worked and thrived in the town. The County of Norfolk has long been a favourite of the Royal family. This legend concerns a pedlar called John Chapman who lived in Swaffham, Norfolk. Now this pedlar had a dream that if he went to London Bridge he would hear news greatly to his advantage. Only when the dream was repeated the next night did he act on it, and packing his bag, he and his dog walked to London. He found his way to London Bridge early one morning and stood there waiting for the promised news. The hours passed, and eventually a shopkeeper who had been watching him just standing there gave in to his curiosity and walked across and asked if he needed help. The pedlar told him of his dream, and the shopkeeper laughed, saying that if he had believed in dreams he would be in a place called Swaffham, where ever that was, digging up gold under the apple tree of a man called Chapman, but that he didn't believe in dreams and that the pedlar should go back home and carry on with his life. The pedlar thanked the man for his advice, and made his way back home. Upon reaching home, he dug under his apple tree and found a small pot filled with gold coins. He put the coins away and cleaned the pot, finding a strange inscription. As he couldn't understand the inscription he put the pot on his stall and life carried on. When the monk had gone, the pedlar quickly dug under the apple tree again, much deeper this time, and eventually found a much larger pot again filled with gold. Soon after, the inhabitants of Swaffham decided to rebuild the church, and were very surprised to find the pedlar offering to pay for the north aisle and the tower. From 1435 to 1474, John Botewright was rector of Swaffham, and compiled the 'Swaffham Black Book' which is an inventory of all the work done on the church. From the entries it can be seen that a John Chapman paid for the rebuilding of the North Aisle. Today, in the choir of the church stand two pews. One with carvings of a pedlar and his dog, and the other of a woman looking over the door of a shop. Archaeologist and Artist, Discoverer of the Tomb of Tutankhamun. Howard Carter was born in 1874 in Kensington, London. He became famous world - wide for his discovery of the tomb and the fabulous treasure of the ancient Egyptian boy King,Tutankhamun. 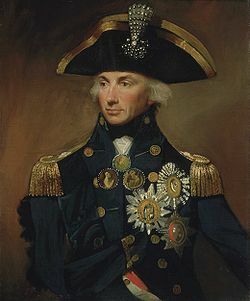 Howard’s parents Samuel and Martha were both Swaffham people and they had eleven children of whom Howard was the youngest. Samuel was a noted animal artist. Howard spent much of his childhood with his relatives in Swaffham and often accompanied his father to the large houses locally when he had been commissioned to paint the family’s animals. One such establishment was Didlington Hall, home of Lord and Lady Amherst a noted historian and collector of ancient Egyptian antiquities. Howard’s interest in Egyptology started from this point and the Amherst’s were instrumental in helping Howard to a post at the British Museum. He was, like his father a talented artist and helped to make copies of tomb drawings at the museum. His obvious ability soon meant that he had the chance to work for the Egypt Exploration Fund actually in Egypt copying tomb paintings directly rather than just drawings of them. 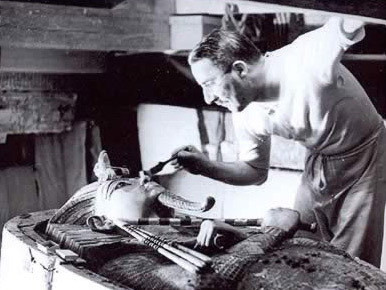 Eventually Howard became an assistant to Flinders Petrie, who was in his time the most famous excavator in Egypt. Under Petrie’s tutelage Howard quickly became a very knowledgeable excavator himself. By 1897 Howard had a position of great responsibility as the Inspector for the Service of Antiquities acting for the Egypt Exploration Fund. In 1900 he was appointed Inspector of Monuments for Upper Egypt and Nubia – one of the most responsible jobs in the service – overseeing excavations in the Valley of the Tombs of the Kings, as well as being in charge of security there. By 1915 Howard had formed his famous partnership with Lord Carnarvon. He funded Howard’s excavations for several years but by 1922 Carnarvon thought that the Valley of the Kings held no more secrets. Many other experts agreed with him but Howard felt so strongly that there was still one more tomb to find that he offered to finance the excavation of the last small area himself. Carnarvon generously agreed to finance one last season in the valley. On the 1st of November 1922 Howard with a team of one hundred men began the work of clearing the rubble. On the morning of the 5th November a step was found and digging down revealed a flight of steps leading to a sealed door. That night Howard wrote in his diary, ”Found tomb under tomb of Ramses VI. Investigated, same, found seals intact”. The stairway was filled in and Carnarvon sent for. The 26th of November 1922 was in Howard’s words, “the day of days, the most wonderful I have ever lived through, and certainly the one whose like I can never hope to see again”. He had found the Tomb of Tutankahmun and was to spend the next ten years excavating its treasures. Diana Spencer was born in the late afternoon on 1 July 1961, in Sandringham, Norfolk. She was the third child of Viscount and Viscountess Althorp (née Frances Roche, later Shand Kydd). The Spencer family was hoping for a male heir to carry on the Spencer title. The Spencer family is one of Great Britain's oldest and most important families, closely allied with the royal family for several generations. As the family was expecting a boy, no name was chosen for a week, until they settled on Diana Frances, after a Spencer ancestress and her mother. Diana grew up in Park House, which was situated near to the Sandringham estate. In 1973, Lord Althorp began a relationship with Raine, Countess of Dartmouth, the only daughter of Alexander McCorquodale and Barbara Cartland. Diana received the title of Lady after her father inherited the title of Earl Spencer in 1975. Lord Spencer and Lady Dartmouth were married at Caxton Hall, London, on 14 July 1976. As Countess Spencer, Raine was unpopular with her stepdaughter Lady Diana. Lady Diana was often noted for her shyness while growing up, but she did take an interest in both music and dancing. She also had a great interest in children. After attending finishing school at the Institut Alpin Videmanette in Switzerland, she moved to London. She began working with children, eventually becoming a nursery teacher at the Young England School. Diana had apparently played with The Princes Andrew and Edward as a child while her family rented Park House, a property owned by Elizabeth II and situated on the Sandringham Estate.